Yesterday I told you about the “fakers,“ those who falsely claim their pet is a service animal in order to take with them wherever they go. Now that we know there are some bad actors out there that are claiming their pets are service animals, what can be done about it? By knowing what the Americans with Disabilities Act states, you can protect yourself and your business without violating the rights of persons with disabilities. For those of you outside the US, these tips may help, but check your country’s laws pertaining to the use of service animals. First of all, let me say this: Not all disabilities are obvious. Several people commented on seeing a person that did not “appear” to be disabled with a service animal. Just because they don’t appear so to you does not mean they’re “fakers.” There are dogs trained to do amazing things to help persons with seizure disorders, PTSD, and a myriad of other disabilities that you don’t readily recognize. So what does the law say about service animals? As of 2011, only dogs are recognized as service animals under ADA. 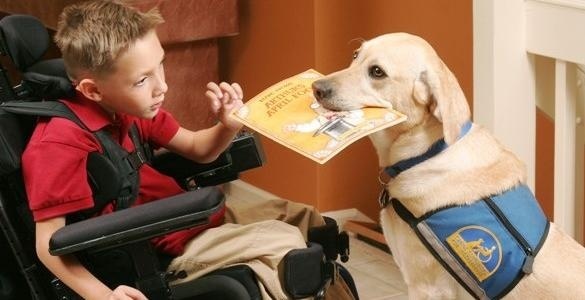 The dog must be trained to do work or perform tasks for the person with a disability. The exception is miniature horses, and they are addressed below. No other animals are recognized as service animals under ADA. Businesses must allow service animals to accompany people with disabilities in all areas where other members of the public are allowed to go. No exceptions. A person with a service animal cannot be isolated from others or treated differently, and cannot be charged fees not charged to those without service animals. If you treat a person with a service animal differently, you are guilty of discrimination. If the person cannot answer those questions, you may have a faker on your hand. Time to let security or law enforcement take over. Some states, such as Hawaii, are really cracking down on fakers. 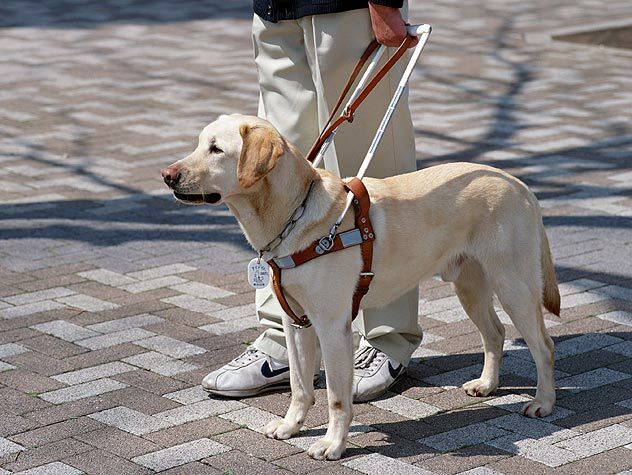 You cannot ask if the need for the service animal is obvious (e.g., the dog is guiding an individual who is blind or is pulling a person’s wheelchair.) You cannot ask about the nature or extent of an individual’s disability. You cannot require proof that the animal has been certified, trained or licensed as a service animal, or require the animal to wear an identifying vest. A service animal must be under control at all times. That means they must be leashed, harnessed, tethered, or otherwise restrained unless doing so would interfere with the service animal’s work or the person’s disability prevents the use of such devices. If the dog is jumping up on others, tearing up merchandise, or otherwise out of control, you can ask the person to get their dog under control, and if they don’t, you can then ask them to remove the dog. However, if they do so, you must allow them to then return without the dog if they wish. 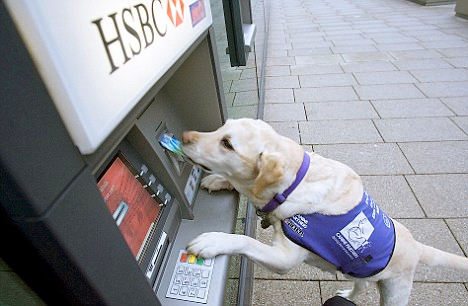 Business staff are not required to provide care or food for a service animal. Therapy dogs and Emotional Support Animals serve important functions, but they are NOT service animals, and as such, are not covered under the ADA. Service animals in rental homes are covered under The Fair Housing Act and the Air Carrier Access Act covers service animal provisions for airline travel. « Fake Service Dogs? Yep, it’s a HUGE Problem. Those pictures of the dogs remind me of Keely!!! She is doing her mum proud I’m sure! Hope your mouth isn’t hurting anymore and thanks for the information! I read both posts, sometimes I can’t believe what kind of ideas some people can have. Fake Ser ice Dogs, where is the limit? Many thanks for the information Rumpy, thanks for writing about topics like that. Thank you for the two legal questions you can ask. Great information in both posts. Very informative posts from both today and yesterday! Well…in fact I didn’t know that we don’t say Therapy dogs and Emotional Support Animals are service dogs.For those who work as service dogs, humans should think of what really service dogs mean. I can only speak for how they are defined here in the US, Kevin. In the US, a service dog is an animal that’s trained to complete tasks that benefit a person with disabilities. It is that service that makes them able to be brought into public facilities. It simply puts the person with disabilities on a level playing field with an abled person. I’ve had a recommendation for a service dog for several reasons. However, I have 5 dogs already and am not allowed to have a service dog if I have that many dogs. The rules for having a service dog are something many people don’t know about. I didn’t know that either. Service dogs require a great deal of attention and care. An excellent post with VERY important information. If more businesses and public were aware of how REAL service dogs should behave, then people with invisible disabilities wouldn’t be treated poorly and fakers would be too embarrassed to attempt such atrocious behavior. When I see fake service dogs (and it is always SO obvious to an informed person- dogs tugging at their leashes, growling at other dogs or customers, soiling in a business, etc.) I complain to the management. I make sure the business knows what can be asked and why I don’t believe the dog is trained/working. Education is power! And it is up to all of us to stop this fake service dogs epidemic so that real service dogs can continue to do their jobs. Absolutely! Many people with disabilities benefit from the help of a trained service animal. But fakers put others at risk by bringing untrained dogs into the public arena. That little horsey is so cute! The problem with celebs is that they have doctors that are eager to write them letters for “emotional support” service dogs. Boo! Emotional support animals are not considered service animals under ADA and don’t have to be given admittance to most businesses. OMD! 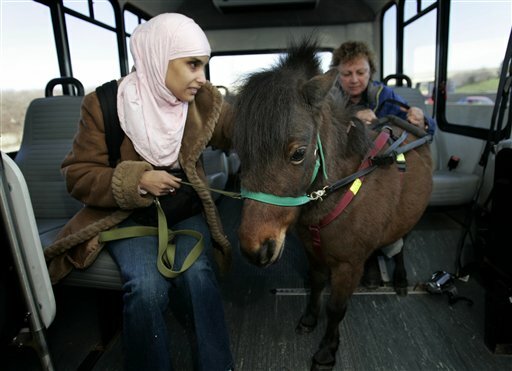 I had no idea that miniature horses are service animals as well!!!!!! wow!! That was neat to learn! Thanks for sharing this info and what it is legal of us to ask of them. Thanks. Remember though, that’s in the US. Consult Canadian law to see what’s allowed there. I was amazed at the extent of fakery that goes on. I think they only care about having what they want when they want it. You always have something interesting to say. Hey, you may not agree with me, but you can’t say I don’t challenge your thought processes! My only concern is that people will feel it is okay to challenge people with real service dogs. I hope that we give people the benefit of the doubt unless the dog is unruly or otherwise causes a specific reason to doubt that they are a service dog. 75% of disabilities are “invisible” to a casual observer so it usually isn’t obvious why someone would need a service dog. People with psychiatric disabilities for example, may use a smaller service dogs in order to function in public; size also has little to do with a dog’s ability to sense seizures or provide other services such as alerting a deaf person. I can’t stand the fakers but I also can’t stand when a disabled person has to justify having their Service Dog with them. Jen, I hope you don’t mind, but I posted a link to this piece on my Facebook profile. I feel it’s valuable information everyone should know, as we move more disabled folks out of the shadows. If you do mind, please let me know, and I’ll just remove it. I appreciate it! Please share!!!! The owner of a restaurant in town kicked out a veteran and his real service dog because he thought the man “didn’t look disabled.” Quite a few people had a peaceful protest outside, and after a week or so the owner agreed to meet the veteran and admitted that what he did was wrong. The protest and news coverage of the incident definitely helped educate him and others about what service dogs can do and what is allowed. Sadly that happens far too often. Fakers aren’t helping matters. I’m all for therapy animals. I think they do a world of good. I have apron pen with fakers because they make it hard for people with disabilities. I’ve heard of dogs that are trained to monitor their owner’s blood sugar, and give an alert if it falls too low. It’s amazing the ways dogs can help us! They are very smart, and have the edge in so many ways. Thank you for the really informative pair of posts, Rumpy and Jen. Fake Service Animals? What is next. There are days I simply despise people. Thank you for the information. Jen, I understand what you are saying about fake service dogs, but there are many people with disabilities that are not visible to the eye. These people just don’t want to give out personal information about their disability to complete strangers. As a person with severe social anxiety, sometimes it is easier to show a card than dealing with people. Please contact me if you would be interested in giving free certification cards to some of your readers that need a card for their service animal. I hope you continue to keep writing more. I am not interested in giving out cards. Cards don’t stop the fakers or promote respect for legitimate disabilities.